Thank heavens for a rainy Saturday to temper hot, dry winds! ‘Tangerine Beauty’ crossvine sent out lusty cheers to any hummingbird or bee winging by. I cheered since maybe it wet down oak pollen that had my nose on the run. White potato vine (Solanum jasminoides) celebrates more demurely. This one is anchoring itself to a Texas pistache that died last year. I’m going to train it over its natural trellis. Native Carolina jessamine vine challenges anyone to pass by without stopping for a whiff of sweet fragrance. Normally, it would be in full gear right now, but early heat took its toll. For weeks already, a neighbor’s aloe heralds any pollinator looking for a rest stop. She’s had them 20 years in a bed beyond a robust Agave americana. Bees are also diving into snug apricot-orange cups on silvery-leafed native globe mallow (Sphaeralcea ambigua). I didn’t move quite fast enough for a great shot of this bee on spring starflower (Ipheion uniflorum), but they’ll be back on these long-blooming miniature bulbs. Last fall, I planted a few more along the front door sidewalk to join oxalis, a passalong from a neighbor years ago. Bees get their choice: pink or blue! They’ll soon discover native baby blue eyes (Nemophila menziesii), too, joining up with native golden groundsel (Packera obovata). Freesia laxa and white oxalis chime in against red leaves emerging from my ‘New Dawn’ climber. In a garden we taped last week, Chinese ground orchids (Bletilla striata) cluster in hot pink waves under a live oak tree’s dappled sun embrace. Many gardeners are asking: what vegetables to plant and when? First, while soil and night temperatures are cool, use a soil thermometer to avoid premature transplant rot or lack of seed germination. Jeff Ferris from The Natural Gardener explains why it’s so important to test soil temp before planting in spring and fall. Next, keep your row cover handy. Summer crops can be damaged with cold nights or snappy surprises. And check out our Resources for Travis County’s planting times. We’ve all been there. We buy a house that comes with a weedy, overgrown lawn. Or, we’ve let shrubs get out of control or we just need to update. Designer Leah Churner from Delta Dawn Sustainable Gardens explains how to restore and renew. 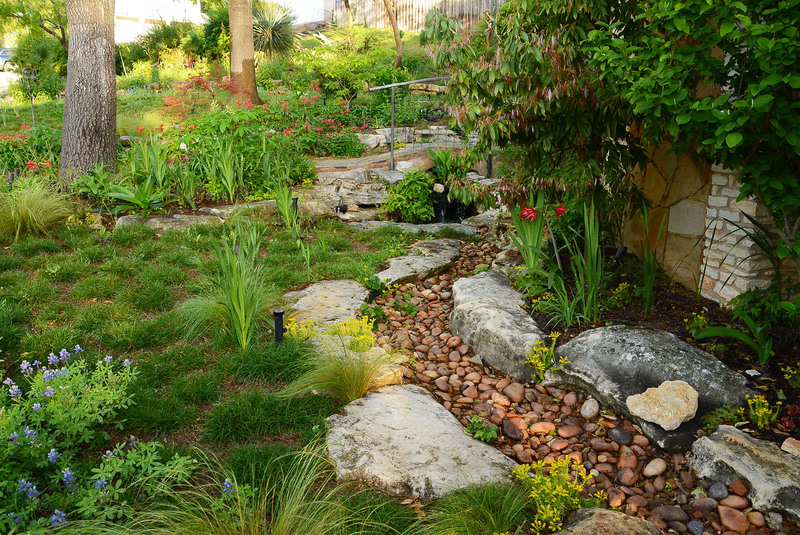 On tour, when Syd Teague moved from Tucson to Austin, she wanted a water thrifty garden. As she shaped her land, it became her outdoor laboratory from succulents to flowering perennials. ← Boing! Spring Already Sprung!